In my home all are big fan of chicken as it is low in fat when compare to other meat. So i always make Roast chicken for week ends and for some festivals. 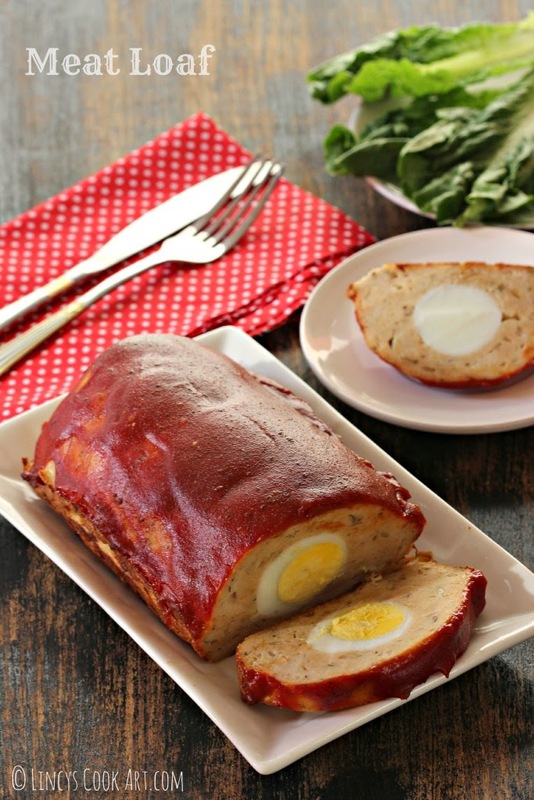 This time i wanted to try some thing new in chicken which i have not made earlier and i finally decides to make my long awaited meat loaf recipe using chicken. Meat loaf is generally prepared using Minced beef and sometimes with chicken. Mostly chopped bacon is added with the meat, some times eggs are kept at the middle of the loaf. Some people like with the sauce on top of loaf and some don't. I prefer making this in chicken as it is less in fat content and keeping eggs inside and topped with a tomato sauce. When i saw the recipe here i was bit confused because it is bland in taste for Indian palate and i have added spices and herbs of my choice to give little more taste and flavour to suit my taste buds. Hard boil 3 eggs in water for about 8-10 minutes and keep them in cold water for sometime and peel them; set aside. Heat oil and butter together in a pan and add the chopped onion and add a pinch of salt and cook till soft. Add the chopped garlic and cook them for about a minute or two. Now add the chilli powder/ paprika and swich off the gas. The raw taste of chilli powder goes when cooked in the hot oil; Allow the mixture to cool. In the meat bowl crack and add the egg, cooked onion mixture, thyme, oregano and season with pepper and salt; mix well. Now add the bread crumbs and mix well. If you feel sticky grease hands with oil and mix well. Divide the mixture into two halves. Take a loaf tin or baking tray and keep the one half of the meat mixture and level the base of the loaf. Then keep the 3 boiled eggs as a row on top of meat mixture. Top this eggs with another meat ball and spread to cover the eggs. Do not press well to seal. Just cover the eggs with the meat mixture. Preheat the oven 180 degrees for 10 minutes and bake the meat loaf and for about 30 minutes. Make the tomato topping by mixing tomato ketchup, mustard paste, chilli powder/paprika, pepper powder and lemon juice. Spread the topping using a spoon and keep the loaf tin and bake them again and for another 15 to 30 minutes till the skewer inserted comes out clean. Allow the loaf to cool for about 15 minutes, then cut the loaf like thick bread slices and serve. Very tempting to taste this. Looks very yummy. looks amazing lincy, mouthwatering, really very creative. what do you serve this with?? I used to serve this meat loaf with some bread and potato wedges. You could add any leafy salad too.